Norfolk County and its partners are fueling the creativity and entrepreneurship of Norfolk students through the Student Start Up Program (SSUP Norfolk). Entrepreneurs grow in Norfolk County, and we want to cultivate those abilities and instincts in students in Grades 6 to 12. Information about the 2019 Student Start Up Program will be released by the end of April. If you have any questions, please contact us. This year, 97 student businesses applied to the SSUP program. Sponsors helped fund 39 student businesses. SSUP Norfolk provides students in Grades 6 through 12 the opportunity to try self-employment during their summer holidays, July and August, as a viable way of employment and does not interfere with their studies throughout the school year. Students are required to fill out a business plan template and encouraged to increase their chances of being a successful applicant by further elaborating on their venture. The template covers the basic components of a business plan, structure, and highlights the importance of putting ideas into action. Applications are reviewed. Successful applicants are notified by the end of June and awarded $200 to get started. Throughout the summer, students are encouraged to use the support of the sponsors to enhance their business and maximize their experience. Midway through the summer a meet-and-greet event is held where sponsors and students interact and are mutually encouraged. After the students have run their business through the summer break they submit a report providing a business analysis of their efforts. Students that critique his or her business and attach a picture of them engaged in their business are awarded a $100 bonus for a job well done. The program provides real experience in actual business and exposes young people to an alternative of being an employee or the ability to offset part-time work. They have the opportunity to following their creativity and dreams. With the support of the communities and sponsors from a wide range of backgrounds, contacts and knowledge, students receive a great experience as do all involved in growing as entrepreneurs and recognizing their true value. CLOSED: The application deadline closed on June 15, 2018. For more information, contact Norfolk County Tourism & Economic Development, at 519-426-9497 or email business@norfolkcounty.ca. Companies and organizations in Norfolk County are welcome to contribute as sponsors so more student businesses can be funded. Download SSUP Sponsor form to be invoiced. 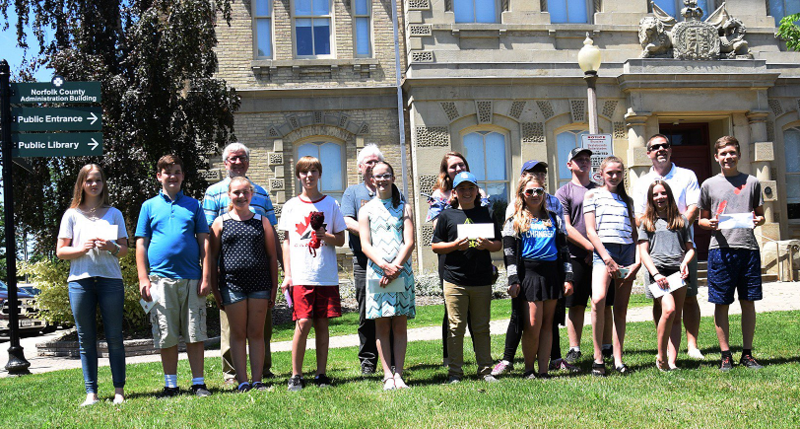 In 2017, sponsors of Norfolk County’s Student Start Up Program (SSUP) funded 94 student businesses involving 107 young people in Grades 6 to 12 in summer 2017. Norfolk County received 188 applications from students in 26 elementary and secondary schools across the municipality. Not all applications could be funded. In 2016, 40 student businesses involving 52 young people in Norfolk County were funded thanks to sponsors of the SSUP program.